After weeks of work and coordination between our engineers and operation staff, we're excited to announce Whiplash Lot Control. Critical to cosmetics, supplements, foodstuffs, and more, lot control allows us to track inventory and trace individual shipments back to original production runs. In the event of a product recall, Whiplash can quarantine affected lots. Lot Control is an optional feature and must be enabled. Details here. Lot Control enabled us to roll out two new pick strategies: FEFO (First Expired, First Out) and FIFO (First In, First Out). By default, we pick items strategically to optimize for efficiency and to minimize storage costs. With FIFO or FEFO enabled, orders will still route to the closest facility—but older or expiring inventory will be consumed first. We can also generate reports upon request that will notify you of soon-to-expire products. 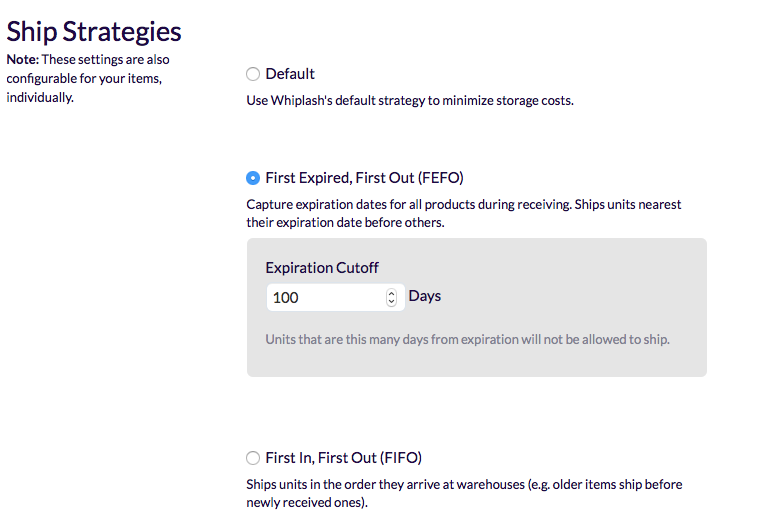 Ship strategies can be enabled account-wide in your customer preferences panel, or at the item level.